The former Liberal government re-opened mothballed hospital sites to deal with the overcrowding and lack of capacity at Humber River and other regional hospitals. Devlin was also the President of the Ontario Conservative Party during the Mike Harris years in which Ontario’s hospitals suffered massive restructuring. In order to cut $800-million, the Harris government spent $3.9-billion in restructuring costs, according to the Provincial Auditor. Local governance and democratic hospital boards were eliminated from dozens of communities, reams of hospitals were closed, and, ultimately, the restructuring led to the devastation of services in many medium and smaller hospitals. Warnings about hospital overcrowding have been repeatedly provided to Ontario’s government. The following backgrounder contains recent reports and warnings about the problem from Ontario’s Auditor General, Health Quality Ontario, and the Canadian Association of Emergency Physicians. It also contains data from the Canadian Institute for Health Information comparing hospital bed capacity across Canada and the OECD, comparative hospital nurse staffing levels and public hospital funding. The evidence is irrefutable. 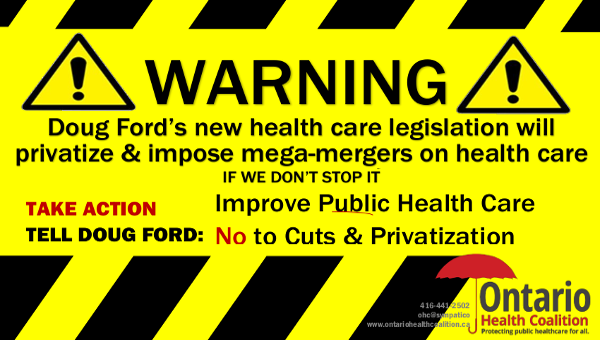 Ontario has cut more hospital beds and staff than any virtually all peer jurisdictions. Ontario has dropped to the bottom of the country in public hospital funding. The resulting hospital bed shortage and serious overcrowding situation compromises patient and staff safety. Ontario’s government must urgently reopen hospital beds and restore capacity to safe levels. Recognize that the emergency department crisis reported by hospital executives is a symptom of a systemic shortage of hospital beds that must be urgently rectified. Fund public hospitals to meet evidence-based measures of population need and ensuring that the funding goes to care. Reduce Ontario’s hospital overcrowding to meet the 85% occupancy benchmark that is the internationally-accepted indicator for the safe level of crowding. Commit to ensuring that no patient will be left on a stretcher in a hallway or public area overnight or for days waiting for a hospital bed. A number of hospitals have created secondary waiting areas so that they can report that patients are moved out of emergency departments within target wait times. But patients are simply moved to areas with different names to continue waiting. Ontario’s government must take steps to ensure that reporting is honest and captures the true extent of the problem. The audit team describes a state of severe overcrowding in the hospitals they visited. Patients are waiting on stretchers or gurneys in hallways and other public areas, sometimes for days (page 446). Bed occupancy rates of greater than 85 per cent are unsafe and contribute to infections (beds are too crowded and turn over is too fast). 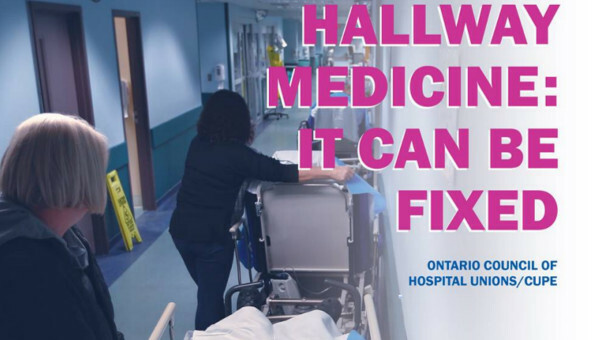 During 2015, 60 per cent of all medicine wards in Ontario’s large community hospitals have occupancy rates of greater than 85 per cent (page 431). The Canadian Institute for Health Information reports that Ontario hospital patients have the 2nd highest rate of potentially fatal sepsis infections in Canada (page 431). 1 in 10 patients requiring admission to hospital are waiting too long in emergency departments. The provincial government’s target is 8 hours from triage (90 per cent of patients are supposed to be transferred to a bed withing 8 hours). But in the hospitals the audit team visited it took 23 hours for 90 per cent of the patients to be transferred to the ICU and 37 hours for transfers to other acute care wards (page 429). and planned operating room closures. 45 per cent of large hospitals have one or more O/R closed due to funding constraints (page 450). There has been no improvement in wait lists for elective surgeries for the 5 years leading into this audit (pages 430-431). 58 per cent of hospitals ran out of money for some types of surgeries and had to defer them to the next fiscal year (page 444). Patients with traumatic brain injury and acute appendicitis are waiting 20 hours or more for emergency surgery (page 430). Wait time targets are not being met for the following types of surgeries: neurosurgery, oral and dental, thoracic, vascular, orthopedic, gynecologic, ophthalmic, cancer (page 451). “With the shortage of hospital beds and recurring issues with acute care capacity, hospitals increasingly face a situation where more patients require admission than there are beds to accommodate them. The current approach to dealing with Access Block due to hospital crowding involves delaying the outflow of admitted patients into appropriate inpatient areas; resulting in an excessive and unsafe use of EDs to inappropriately ‘warehouse’ admitted patients, both stable and unstable, for long periods of time. This ‘boarding’ of admitted patients within the ED results in EDOC and thus creates delays in seeing new patients presenting to the ED. Surveys have shown that patients attempt multiple other options prior to accessing the ED. Moreover, patients of lower acuity and urgency do not occupy acute care stretchers, require little nursing care, and typically have brief treatment times. The myth of ‘inappropriate use’ should be permanently dispelled, and administrators and politicians should be encouraged to avoid attributing EDOC to ambulatory patient ED health services access…. The lack of acute care beds in Canada means that most hospitals frequently operate at unsustainable occupancy rates of higher than 95%, a level at which regular bed shortages, periodic bed crises, and hospital overcrowding are inevitable. Functioning at capacities above 95% occupancy does not allow for flexibility in the system to accommodate the natural peaks in patient volumes and admissions that will periodically occur.” Affleck et al., CMAJ 2013, Pages 362-363. The evidence is indisputable that Ontario’s government has cut hospital care to the lowest levels of all provinces in Canada. 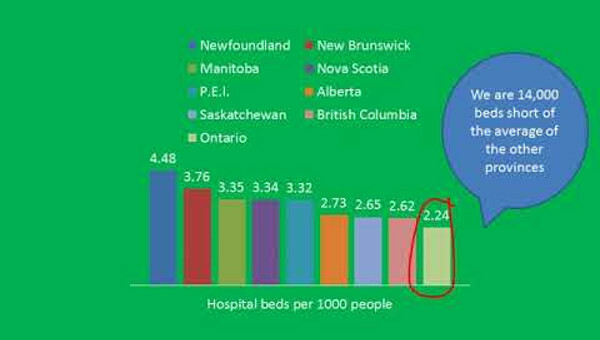 As illustrated in Chart 1, Ontario has the fewest hospital beds left per capita of any province, and that number is declining. In 2008-09, Ontario had 2.5 hospital beds per 1000 population, according to Canadian Institute for Health Information (CIHI) data. Today that number has dropped to 2.3 hospital beds per 1000 population. The other provinces average 3.5 hospital beds per 1000 people. The difference of 1.2 beds per 1,000 population is vast. On an aggregate per capita basis Ontario now has 16,440 less hospital beds than the average. 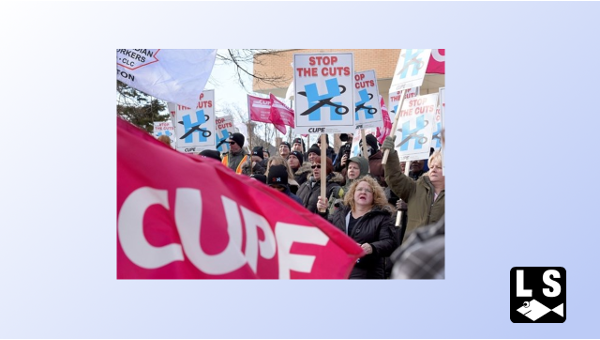 In fact, Ontario’s government has cut more than 18,000 hospital beds since 1990 and still the cuts are continuing. The above data gives a statistical overview of some key indicators of hospital service levels in Ontario compared to other jurisdictions in Canada and internationally. The following section measures hospital funding compared to other provinces in Canada. As noted above, Ontario’s government has set global hospital operating funding increases below the rate of inflation for 9 consecutive years – the longest period of hospital cuts in our province’s history. Until this year, hospital global funding had been frozen for four years in a row. Today, by all measures, Ontario has dropped far below the other provinces in hospital funding. Ontario has not conducted a hospital bed study to measure population need and assess how many hospital beds should be planned for more than twenty years. To the extent that data is being used in planning at all, the numbers that are being used are two decades out of date. Instead of using an evidence-based planning approach, Ontario’s health policy has centred on constraining hospital budgets, cutting services and reducing patient length of stay. As a result, Ontario is suffering from a shortage of hospital beds and services that is negatively affecting patients’ access to care and safety. Ontario’s hospital occupancy levels are extraordinarily high. According to Ministry of Health data, by 2010 there were, on average, 30,164 inpatients in Ontario’s 30,810 hospital beds. The provincial hospital bed occupancy rate is 97.8%, much higher than other jurisdictions. By comparison, the OECD reports an average occupancy rate for acute care beds of 75%. In the United States, the average hospital occupancy rate is 68.2%.1 Most often cited in the academic literature, a target hospital occupancy rate to reduce access blockages and improve outcomes is 85%. The consequences of hospital overcrowding warrant public attention. Within hospitals, overcrowding is associated with serious quality of care issues. Overcrowded emergency departments do not have appropriate staffing ratios for critical care or intensive care patients who require intensive monitoring by specially trained staff. Across Europe, hospital occupancy rates have been cited as a determining factor in hospital-acquired infections (HAIs), and indeed Ontario has experienced repeated waves of Hospital Acquired Infection outbreaks. Cancelled surgeries and prolonged waits are associated with poorer health outcomes. Ontario’s extremely high occupancy poses a significant threat to patient safety and quality of care. Not only is there a problem getting into hospitals, there is also a serious issue of patients being discharged too early and without placement in home care and in long term care homes. The Advocacy Centre for the Elderly reports that they receive frequent complaints from patients who are subject to pressure tactics to move them out of hospitals. 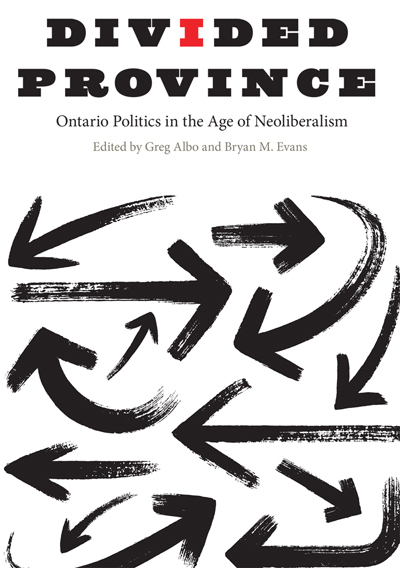 Divided Province: Ontario Politics in the Age of Neoliberalism, Edited by Greg Albo and Bryan M. Evans, McGill-Queen’s University Press (2019). Hospital policies may include statements that if person refuses to pick from short lists of long term care facilities that are not of their choosing, or if the patient refuses to take first available bed, then will be charged a large per diem ranging from $600 a day to $1800 a day.5 In many cases the charges levied against patients in an attempt to move them out of hospital are unlawful. National Center for Health Statistics, “Health, United States 2010”, 2011, page 354. See: Forster, A.J. et al “The Effect of Hospital Occupancy on Emergency Department Length of Stay and Patient Disposition” Academic Emergency Medicine, 2003; CIHI “Understanding Emergency Department Wait Times”; B.H.Rowe et al., “Frequency, Determinants, and Impact of Overcrowding in Emergency Departments in Canada” 2006; OHA, OMA, MOHLTC, “Improving Access to Emergency Care: Addressing System Issues” 2006. Ontario Hospital Association, “ALC Study”, June 2011. Wahl, Judith, Advocacy Centre for the Elderly. “ALC, Hospital Discharge, Long Term Care and Retirement Home – What Happened to the Law and Ethics?” Power Point presentation 2011. The Ontario Health Coalition is comprised of a Board of Directors, committees of the Board as approved in the Coalition's annual Action Plan, Local Coalitions, member organizations and individual members. 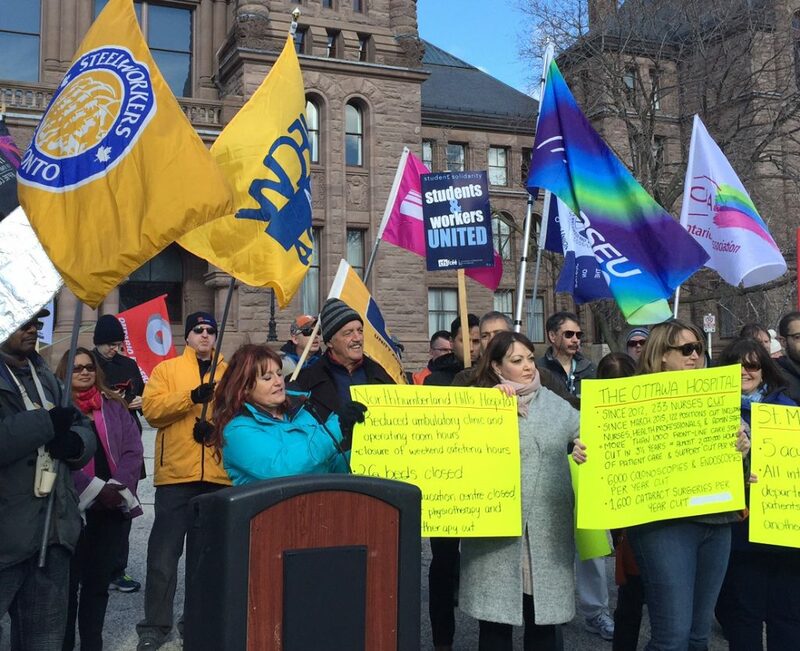 Currently the Ontario Health Coalition represents more than 400 member organizations and a network of Local Health Coalitions and individual members. Follow their tweets at @OntarioHealthC.